Article reprinted with permission from Acreage Living Newsletter. The 2018 season has ended and I wanted to share a few frequently asked questions, problems, concerns, and trends that I am seeing. Rather than waiting until next year to address these issues, it seems easier to do so while the year is still fresh in our minds. Where was spotted winged drosophila (SWD)? I received a lot of calls, emails, and hushed conversations (because I think the individual did not want to jinx themselves) asking where SWD was this year. I wish I had an answer for this one because it was next to nowhere and when found was commonly in very low numbers across the state. This was not true for surrounding states but I think many of us enjoyed the break and worm-free berries this year. There were instances I heard of where SWD was found, a single insecticide application was made, and then populations never recovered to justify a follow-up application. Do not assume we will be this lucky next year…be ever vigilant in getting those traps out a few weeks prior to first harvest. While there is constantly new research coming out every winter, the SWD publication I put together is still very much relevant. https://store.extension.iastate.edu/Product/14479. Japanese beetles were another interesting case this year. Overall, across the state numbers seemed to be back close to normal following a largely down year in 2017. Interestingly, first emergence was about normal but then we hit very wet weather for a few weeks in late June. There was discussion and mumblings (or maybe hopefulness) about the saturated soils drowning out the larvae before they could emerge. That proved not to be the case. There really is not anything new on the market to manage them chemically. Grandevo, a newer bio pesticide is labeled for their control but reports I hear from the field is that it is not effective. Unfortunately, I have not found any studies to confirm one way or the other. One often-overlooked control for Japanese beetle is the use of insect barrier to prevent adults from reaching the crop. Pro-Tek netting is readily available and has proven itself effecting on cucumber beetles and other insects. It is something worth looking into if you are looking to minimize insecticide applications. Where Can I Sell my Aronia? I receive this question repeatedly, especially during August and September. The struggle to sell aronia has been a constant problem and not likely to go away in the near future due to global competition with Poland, the number one producer of aronia juice concentrate and powder extracts. While Iowa producers were once able to offload fresh aronia berries, the recent closing of a major aronia buyer left a gap in the market and many farms struggled to sell their aronia berries this year. If you struggled to sell your product this year, I strongly suggest you continue to look at other options for next year. Market exploration could include direct marketing, processing, or other wholesale outlets. The best advice I can provide is to find your niche. Find a way to be different and create your market. Take time this winter and look at your finances as well. Create a clear financial map of all your expenses: pest control, irrigation, labor, mowing, transportation, harvesting, etc. Make sure there is something left for you at the end of the day if you are able to sell them. A quick estimate of income and expenses per acre is in the chart below and may help you answer that question. I tried to be conservative on my price, yields, and expenses but you should enter your own actual numbers. The last few years I have been finding a few spider mite outbreaks late August to early September. Spider mites should be part of your regular scouting program and are quite manageable if caught early as infestations start in small, localized areas. To scout for spider mites, look for small, yellow specks moving around, often on the bottom side of upper mature leaves. Sometimes it helps to knock leaves against a white sheet of paper to make it easier to see them. As the infestation gets worse, leaf bronzing and netting can be found. Bronzing is sometimes confused for potassium or magnesium deficiency, which also tend to be present that time of year. 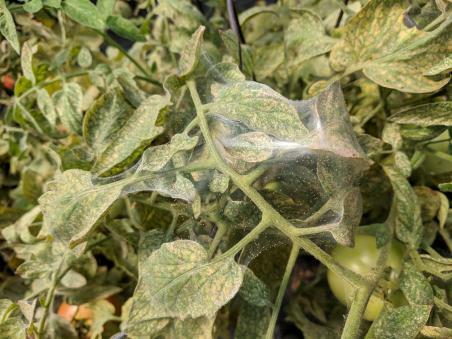 If spider mites are found, insecticidal soaps and oils are effective at controlling them as well as several other insecticides listed in the Midwest Vegetable Production Guide. Infestations caught early can be treated locally rather than treating the entire high tunnel. There are two keys to successful control: 1) thorough coverage of the leaves (including tops and bottoms) making sure to contact the existing mites and 2) a follow-up application 3 to 7 days later to catch anything you missed (let's face it, by late season there is a lot of leaf canopy and it is very difficult to get everything in one pass). If a couple applications of insecticidal soap or oil does not provide adequate control, move onto something with longer residual. Above: Severe spider mite outbreak on tomatoes showing webbing, mites, and bronzing on upper leaves. E-V-E-R-Y Y-E-A-R! Every year I forget to send out a heads up warning about downey mildew coming into the state. Downey mildew does not over winter this far north and thus each year must be moved here via storms. Generally, conditions are right both in the south and here in Iowa during hurricane season for downey mildew to catch a ride up here and infect pumpkins and other cucurbits. Preventive fungicides are listed in the Midwest Vegetable Production Guide. Since I will likely forget again next year, consider yourself warned. Inspections will likely be scheduled visits that start with a phone call from the FDA to determine coverage status. I suggest if the FDA calls, you call them back and talk with them or they may show up unannounced. Likely, they will be doing inspections at farms required to be fully compliant with the law first. If you are claiming exemptions, you should have proof readily available to share with them. The North Central Region FSMA Center created an excellent resource for keeping records to show exemption as well as help you determine where you fit under the rule. You must have a visitor policy in place. Remember that FDA inspectors are visitors and should abide by your visitor policy. However, your visitor policy cannot restrict them from doing their job such as taking pictures, notes, or samples. Expect inspections to last at least half a day and they will be reviewing records. A list of required records and templates is on the Produce Safety Alliance website. Depending on the complexity of the farm, inspections may take a full day or more. Forget to wash hands after using the bathroom or not having restrooms and handwashing stations available. If an inspector sees one of these conditions (to name a few), they will look at habits. Is this an ongoing problem or was this a onetime thing? Join us for a Produce Safety Alliance class where we delve into the details of FSMA. Find team member contacts and dates of upcoming classes on our website. If you have already participated in the class, feel free to give us a call for a personal site visit from our team to help you prepare in case the FDA calls you. The Whole Farm Revenue Protection (WFRP) plan is designed to provide crop insurance to diverse specialty crop farmers. It is intended to provide protection across all farming enterprises including livestock, specialty crops and aquaculture. It differs from other insurance plans because it provides coverage across non-traditional crops and is available in every county in every state. In addition, coverage is based off actual farm production and sales records. It recognizes a proven crop value. This is especially beneficial to farmers who are primarily selling direct to consumer and/or receiving higher prices due to local or organic sales. It covers crop value with minimal processing required to take it to market and does not cover value-added products. Whole farm revenue protection, as the name indicates, is based on the total gross revenue for the total farm as determined by tax form Schedule F over a history of five years (three for beginning farmers). Crop losses may be due to natural causes or declining market value. Losses must be due to reasons not controlled by a farmer. Frost, hail, and floods are common non-farmer controlled losses. Losses due to failing to provide pest management are not covered under this program. For more details regarding the Whole Farm Revenue Protection program, see the Acreage Living Newsletter from January 2017 as well as the USDA RMA Whole Farm Revenue Protection program factsheet. Pesticide Applicator Continuing Instruction Course will once again be offered for commercial applicators of category 1D and private applicators at the Iowa Fruit and Vegetable Growers Conference in Ankeny January 24 - 25, 2019. If you have already been attending CICs, the program at the IFVGA meeting will count for recertification. You will receive the same IDALS form you’re accustomed to, but this form will list the Category 1D training. Private applicators must have attended training for the year their certification expires plus the two previous years for IDALS to consider the training valid for recertification. Example: if your certification expiration is 12/31/18, you should have attended training in 2018, 2017, and 2016. Please follow instructions from your training meeting regarding handling paperwork. The training season for Private applicators is December 1 through the following April 15. Training for 2019 would be 12/1/18 through 5/15/19. You will renew your organization’s commercial applicator license at the same time you renew applicator certification. Certifications expire on December 31 of the expiration year (e.g., 12/31/2016). The training season for commercial and public applicators is each calendar year. A public applicator license is required for individuals applying pesticides at school gardens or other nonprofit managed gardens. Any person attending the CIC and wanting a certificate of attendance must pay the $35 to attend the program. Applicators who miss a CIC training in one or more years during their 3-year recertification cycle are required to renew their certification by exam. CICs cannot be “made-up” if applicators forget to attend a CIC during each year of their certification cycle. You cannot attend extra CICs during a year and have it count for attendance the next year. Cost to attend the CIC course is an additional $35. IFVGA Conference details and registration will be posted at IFVGA.org soon. In addition to the Iowa Fruit and Vegetable Growers Association annual conference, below is a list of other fantastic conferences offered in the region. I encourage you to attend one or more of these conferences. Each is unique and offers something different for attendees.